Tonight we celebrated the 18th Anniversary event for Thompson Boxing Promotions, this one called Path to Glory. The Doubletree Hotel has been the host for almost all of the events from the very beginning. Before the night of boxing began, media and friends of Thompson were treated to a VIP party that featured food, drinks, and videos. It was quite nice, and a considerate thing to do. The main event of the evening featured the unbeaten welterweight Roberto “Dinamita” Arriaza (17-0, 13 KOs) defending his WBO intercontinental title against another fighter with a great record Juan “El Nino” Ruiz (20-2, 12 KOs) in a fight scheduled for 10 rounds. In the first round the fighters seemed to be feeling each other out, testing the reach and power of the other. Ruiz was proving to be a tough customer for Arriaza in the second, as he was able to slip most of the punches that Roberto was trying to land. We had yet to see the power that created all those knockouts for Arriaza. The pace quickened a bit in the third, but we still had not seen any blows that rocked or even did any damage at all from either man. It took three rounds under their belts, but finally both men began to land some leather on each other in the fourth. Don’t get me wrong, still nothing to write home about, but at least some punches were landing now. The fifth was much like the fourth. Both men were now finding their respective targets, but once again, nobody made a big impact. Roberto was utilizing his jab while Ruiz shot off more little combinations. At the halfway point of the fight and we have seen nothing new. Punches landed, but nothing really happened. Finally in the seventh round, Arriaza went head hunting, and found his target. He was not able to knock Juan down because Ruiz was still as slippery as an eel when Arriaza would move in for his knockout punch, but Roberto landed some really good shots. In the eighth the pace slowed down again, with a few punches landing for Arriaza and some for Ruiz. Ruiz had a pretty good round in the ninth as he finally found his target. He had been hit and miss a lot of the fight, but got in a few here. We moved into the tenth and final round. This is what everyone had been waiting to see from Roberto. He came out firing from the start and was landing most of his punches. We went to the scorecards. The judges saw the fight 98-92, 97-93 and 99-91, giving the unanimous decision to Arriaza. He kept his belt and remained undefeated. 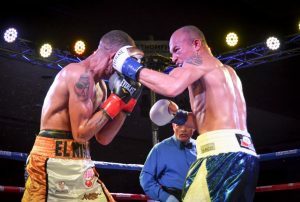 The co-main event saw Erick “All American Boy” Ituarte (20-1-1, 3 KOs) face off against Carlos “Memin” Carlson (22-4, 13 KOs) in a fight scheduled for eight rounds in the featherweight division. Erick was also defending his NABF featherweight belt. These two didn’t waste any time, fighting right at the first bell. They were often forehead to forehead and delivered powerful blows on each other. They kept the heat turned up in the second as both fighters continued to connect. After nine minutes the pace remained the same. This was an excellent back and forth contest and after three rounds was not showing a clear-cut winner. They both came to fight and many good, hard shots were connecting for each man. The fourth was a strong one for Ituarte. His gloves found their target on both the head and body of Carlson. Erick came out in round five the way he worked in the previous one, but midway through Carlos had enough and caught Ituarte several times, snapping his head back when he did so. In the sixth the pair went back to exchanging blows. The seventh was another strong one for Erick. This fight has had big moments for each fighter and we moved into the eighth and final. The action never wavered in this hard fought war, and we went to the scorecards. The judges saw the fight 78-74, and 77-75 twice, all for Ituarte. 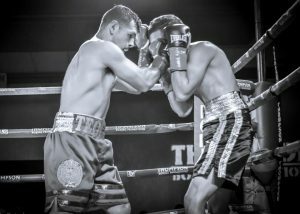 Erick keeps his NABF featherweight title. 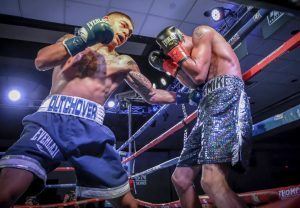 Super featherweights took to the ring as Michael Dutchover (9-0, 6 KOs) faced Mike Fowler (6-15, 2 KOs) in a fight that was scheduled to go six rounds. Dutchover showed off his talents in the first, landing some solid body shots and getting some leather on the head of Fowler as well. It was inevitable that it would be a body shot that dropped Fowler, considering just how accurate Michael was in finding that target. A right hand did the job. But Mike was able to get up and get out of the round. It was body shots again that finally got Fowler out of there. Dutchover had been punishing Fowler’s body all night, and the hard combinations to his ribs and liver ended it at 1:19 of the third round. 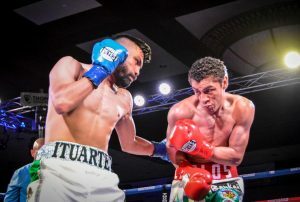 Mario Hernandez (6-0, 3 KOs) stood across the ring from Nery Garcia (1-5) in a fight in the bantamweight division that was scheduled for six rounds. Both men had some good moments in the opening round, but the nod had to go to Hernandez, who landed many really good shots to the body throughout the three minutes. 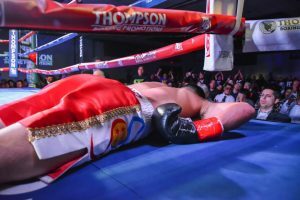 Garcia showed his resilience and heart as he was pounded from rope to rope for the last half of round two, but refused to go down. He ate many body and head shots, but at the bell walked back to his corner. It was the same in the third. Nery was as tough as nails, but at 2:26 of that third round referee Raul Caiz, Jr. decided Garcia had taken enough punishment and waved the fight off, eliciting some boos from the crowd. Still, a good call. 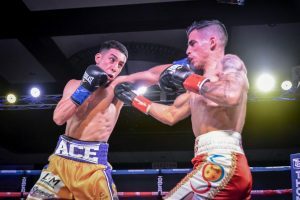 To open up the evening, Ruben Torres (5-0, 5 KOs) went up against Sergio Gonzalez (0-2) in a lightweight fight that was scheduled for four rounds. The first round was uneventful until the final 10 seconds. 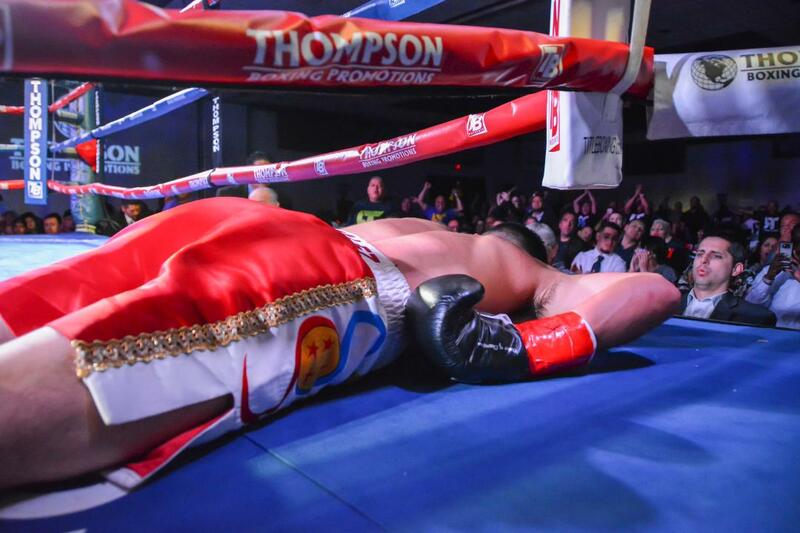 Torres landed a barrage of punches, culminating with a big left hand that sent Gonzalez to the canvas. He got up as the bell rang to end the round. The second round offered nothing spectacular, but in the third Ruben was really landing a lot of leather. Again, he just pounded Sergio with both hands, and sent Gonzalez down and out in a dramatic knockout at 2:15 of that third round. Torres moves up to five for five in the win and KO tally. This was a really fun night of boxing. We only had five fights but it was perfect and the fights were all good ones. Congratulations to Thompson Boxing Promotions on their big 18th Anniversary!!! Exclusive: Joe Joyce would step in the ring with Anthony Joshua or Deontay Wilder this year!